For a 5 months old dog named Little POCKET, the days don’t seem like they will get any easier. 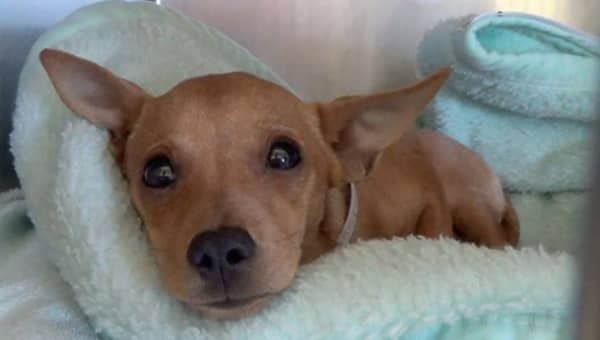 Little POCKET’s owner didn’t want her anymore, and so she gathered all of her toys, and her beloved dog bed, loaded her into a car, and mercilessly surrendered her to the Los Angeles County Animal Control – Carson , better known as the Carson Shelter. Little POCKET, who at her young age seems to sense that the stakes are high, can often be found tucked away shaking in her favorite blanket, cowering in fear from the noise and chaos that is the Carson Shelter. When the lights go out, and everyone goes to sleep, soft and subtle weeping could be heard coming from her kennel space. Little POCKET cries herself to sleep every night wondering what on earth she did to deserve her new fate. Sad indeed. Little POCKET is the sweetest baby. Please SHARE, she may need some help. 56 Responses to "5-months-old chihuahua surrendered to kill shelter with her favorite blanket, left with no more tears to cry"
OH my gosh!!!!!! Please help this sweet little one !!!!! RESCUERS PLEASE HELP !!!!!! OMG who does this!! I would take her in a minute but looked at where she is at and if I could get her to Georgia she would be in a great home with a pure black sister her same breed and size that was rescued from a puppy mill and nobody would take her because she does the reverse sneeze and everyone though she was sick. She lived in a cage for 6 months now she has half an acre fenced yard and is the happiest girl alive and would never mind another one. I would just want her for forever dog, people need to learn dogs or any animal are not throwaways. You have to worry who has a heart that can do that. Lil Pocket was adopted on the 5th of May. Thank goodness, just called Carson but there are so many other animals in need of good homes. Well its only March not sure how she got adopted in May... if you meant March That is also not possible since the last update on March 7 nothing new. Must be a typo... Wish there was an update. She was adopted, that's wonderful!!! Why does she need surgery for what? I’m in Highland... I’m at the very least willing to foster. How do I go about doing that? I just noticed that it says to call the shelter if you are able to foster...310-523-9566. please let us know how it goes! Go to CarsonFosters.com and fill out application to foster, they will get back to you soon! Please! A rescue will back a foster via this volunteer run group. It's heartbreaking I was trying to get dog from Carson the shelter does zero to help, I asked for the dog to be tested with cats they would not even bother to walk her past the cattery. Is she safe? If I can find a place can transport be provided? I’ll take her. Anyone willing to help with a leg of transport? If we can’t find a transport chain, can I pay to have her flown to me in Ohio? She would have a happy furever home here. We currently have two doggies and a pig who would welcome her with open paws. What if I fostered her and we raised money to fly her to you? Call Operation Roger or FB them. Over the Road volunteer truckers who drive coast to coast. Try them ASAP. Some people get pets and then treat them like garbage to be thrown out. I am currently doing jury duty, and the shelter doesn’t open until 12... but a search of the pet ID number says no animal found under that number. Did she find a home yet? Updates? I hope she has been saved!!! Now we need tohunt down the owner!!! why its better that they turned her in instead of putting her off on the road some where! is she still available? I would take her permanently but in NY state, she is wonderful and would be happy here in rural area, I am an Animal Control officer and she would be sleeping with me and spending her whole day with me. The Carson shelter. That place is disgusting! None of the gates were locked. Our kitten was barely 4 weeks and they said she was 8! She developed FELV. I hate That shelter! There were insects crawling everywhere. One guy tried to tell us we could stick the kitten in our purse if we have him money. I hope someone saves that poor pup soon! I mean: i will her with all my love ! I just spoke with Sgt. Torres at the Carson Center, and he did verify that Pocket has been adopted to a furever home. He didn't however tell me when. I'm so happy for Lil' Pocket. Everything I looked at the picture, I started to sob! How people can be so damned cruel is beyond me. Carson is ALWAYS past capacity with wonderful dogs, please find on Facebook "Saving Carson Shelter Dogs" it is beyond critical in southern California every day and LA Animal Services has a complete moron in charge, appointed by the mayor, she was a big campaign donor. Same BS in NYC. CarsonFosters.com, fill out foster application, they will help! I’ll take her. I have 2 chihuahuas already, 1 more won’t make a difference. I just called the shelter, little POCKET has been adopted, indeed, on March 5th!! Thank God. To save her life, I was willing to fly to LA to pick her up and bring her to whoever wanted to give her a loving home... I’m a flight attendant, I can fly anywhere. I’m so happy she’s already rescued!! I'm confused, it states here that she was brought in on March 11/18 and won't be available until March 25 so how can she be adopted already? Unless this is a different dog? Taken from the Birte Foundation website on 3/15/18: Pocket is a 5 month old, short haired Chihuahua and she needs your help. Somehow this little angel was struck and gravely injured in the street. Then simply dispatched to a shelter with a fractured pelvis and a hernia. She has had surgery this week and is still in the hospital. She may need additional surgery too. So we are asking for donations for her medical care. Can you help? You can send money via Paypal. We are also accepting direct-to-vet donations in our name at Malibu Coast Animal Hospital. Reach the hospital at (310) 317-4560. As soon as she is well we will look to place her. But not a day before! The Birte Foundation will not place an animal until we know she is in stable condition and her foster or adoptive home is fully aware of her needs.